The post-workout shake is a fitness tradition that's as old as the gym. But what if you flip the script and take it before training? Turns out there are some good reasons to do so. If you don't eat enough protein, it doesn't really matter when you take it—your gains will be limited. But once you are getting enough, the question becomes how to distribute it. Are three square meals and a snack enough, or do you need to add a shake here and there? If you do toss back a shake, when's the best time to do it to get an edge and maximize recovery? You may have assumed that the answer was open and shut. It's post-workout, right? Maybe not. Following resistance exercise, the rates of both protein synthesis and breakdown are often elevated. [1,2] In other words, you are both stimulating the growth of new muscle, and withdrawing amino acids from existing tissue. Without an increase in amino acids in the blood to fuel the synthesis process, protein breakdown will remain elevated, and could result in a negative "protein balance." Think of net protein balance like your gains account: if it is largely positive, you will build muscle over time; if it's negative, you will break down muscle over time. This is why most experts recommend consuming a protein shake or supplement post-workout. Here's where it gets interesting: If we know muscle proteins break down over the course of a training session—don't panic, we all know it happens—it is reasonable to assume ingesting amino acids or a shake before exercise could be beneficial as well. As Krissy Kendall, Ph.D., discussed in her article "Sore No More," providing amino acids to the body beforehand may actually decrease exercise-induced muscle breakdown. Couple that with the increased protein synthesis that naturally follows exercise and you have a winning recipe for building muscle! There is some research to support this. A study published in 2007 found that when subjects were provided a 20-gram protein shake immediately before lower-body exercise, net protein balance was positive both before and following exercise, and synthesis rates were significantly elevated compared to baseline measures. Time to Shake It Up? The basic takeaway from the 2007 study seems clear enough at first glance: A pre-workout shake is definitely better than nothing, and is perhaps comparable to a post-workout shake in its benefits. But it also raises more questions. For instance, does the study actually show that pre-workout is an ideal period, or does it show that timing doesn't really matter at all and any time is a good time, as long as you get a shake sometime? That seemed to be the conclusion in a meta-analysis performed in 2013, when researchers reported that, after controlling for other factors, there was no difference between different timing protocols on measures of strength or hypertrophy. They concluded that if net protein balance is positive, as is the case following ingestion of proteins, muscle will be built—period. Therefore, the greater the number of times you can stimulate this process throughout the day, the greater your muscle-building results should be. There's additional research to back this notion. 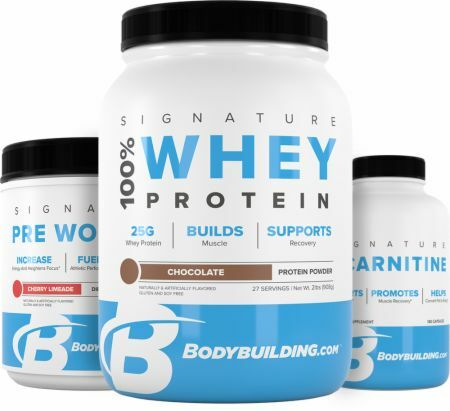 A study published in 2009 showed that consuming protein supplements before and after a workout did not produce greater increases in strength, hypertrophy, or power compared to having shakes in the morning and evening. However, both groups increased all these factors to a greater extent than the control group. "Get enough protein" is still the overriding message here. But given how profound the boost in muscle protein synthesis is following resistance training exercise, I would argue there's still a case for occasionally doubling up and having a shake both before and after exercise, since the body is known to be more receptive to supplemental protein during this time. However, there's a caveat. While anyone who lifts would likely see some benefit from doubling up, it's likely not going to be significant in most cases. However, you should consider it if you are in a particularly demanding phase of training. In-season bodybuilders who are in a higher volume period, or other lifters who may be in a peaking cycle, could potentially notice improved recovery by adding a shake before training sessions. Make sure you understand how your body handles protein, though. Protein takes a lot of energy to digest, so if you take in too much right before you lift, you'll be diverting blood flow away from the tissues that need it the most. You may also run into gastrointestinal issues, particularly with higher dosages too close to intense training. If your pre-workout shake means you have to give a weak effort in the gym out of fear of throwing up, or if it makes you feel full and weighted down, then it didn't help anything. The answer: Start with a low dose—no more than 20-25 grams—and consume it at least 30-60 minutes before training. Once you've adapted to this new routine, play around with the dosage and timing to see what works best for you. After training, stick with fast-digesting sources such as whey, and feel free to increase the amount above what you took in pre-workout. Find the sweet spot, and you might find that better recovery and better gains are your reward. Biolo, G., Tipton, K. D., Klein, S., & Wolfe, R. R. (1997). . American Journal of Physiology-Endocrinology and Metabolism, 273(1), E122-E129. Phillips, S. M., Tipton, K. D., Aarsland, A. S. L. E., Wolf, S. E., & Wolfe, R. R. (1997). . American Journal of Physiology-Endocrinology and Metabolism, 273(1), E99-E107. Biolo, G., Maggi, S. P., Williams, B. D., Tipton, K. D., & Wolfe, R. R. (1995). American Journal of Physiology-Endocrinology and Metabolism, 268(3), E514-E520. Tieland, M., Dirks, M. L., van der Zwaluw, N., Verdijk, L. B., van de Rest, O., de Groot, L. C., & van Loon, L. J. (2012). . Journal of the American Medical Directors Association, 13(8), 713-719. Pennings, B., Koopman, R., Beelen, M., Senden, J. M., Saris, W. H., & van Loon, L. J. (2011). . The American Journal of Clinical Nutrition, 93(2), 322-331. Tipton, K. D., Elliott, T. A., Cree, M. G., Aarsland, A. A., Sanford, A. P., & Wolfe, R. R. (2007). . American Journal of Physiology-Endocrinology and Metabolism, 292(1), E71-E76. Schoenfeld, B. J., Aragon, A. A., & Krieger, J. W. (2013). . Journal of the International Society of Sports Nutrition, 10(1), 53. Hoffman, J. R., Ratamess, N. A., Tranchina, C. P., Rashti, S. L., Kang, J., & Faigenbaum, A. D. (2009). . International Journal of Sport Nutrition and Exercise Metabolism, 19(2), 172-185. Burd, N. A., West, D. W., Moore, D. R., Atherton, P. J., Staples, A. W., Prior, T., ... & Phillips, S. M. (2011). . The Journal of Nutrition, 141(4), 568-573.